Hello friends! How was your weekend? I spend mine with my Mom celebrating her birthday, she turned 49 last week. We had a wonderful today together! Today I’d like to share a bright card I created using a couple of fun products from Waffle Flower. I don’t own many animal stamp sets so I was very excited about Nina’s new Monochrome set with fun animals. 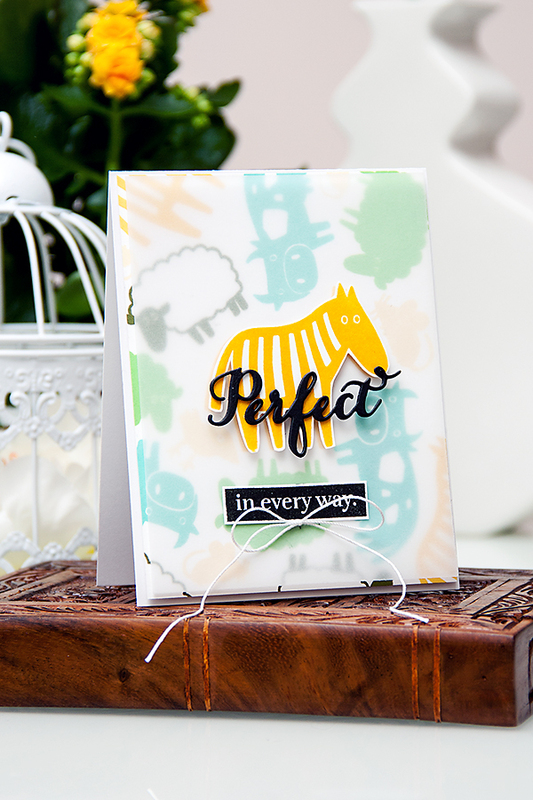 I fell in love with the zebra image and I knew I had to make it the star of my card – so I did! I started working on my card by stamping a background. I used several colors of inks from Hero Arts and stamped all the fun animals from this set. I actually double stamped each image as I wanted to have a more vibrant color. The background turned out exactly the way I pictured it! 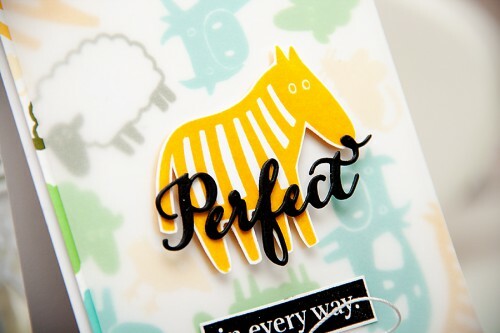 I also stamped an additional zebra image on a piece of white cardstock and cut that image out with my scissors leaving a small white border around it, just like a stamped and die cut image. I than stamped it a second time on top using a clear sticky ink and covered it with clear embossing powder. This gave me an even brighter color and also a bit of glossy shine. Perfect! For my sentiment I used a “Perfect” word die from Waffle Flower and cut it out of black cardstock. I also stamped and cut out a “In every way” phrase. 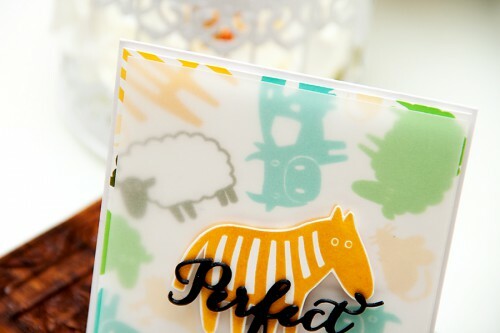 I added a layer of thin vellum to my design, placed my zebra and sentiment on top and that finished my card. Super fun! I also have a video tutorial showing you how I created this project. You can watch it here or on my Youtube channel. Yana your card is so sweet. I have 2 young grandsons (1 & 3) and they love all animals and I know they would love to receive a card like this. Thanks for the inspiration. Your card is really cute and colorful. Now I have another way of using my waffle flower stamp and die that I just received last week. Thank you for sharing. thank you, Natalie! Glad I could inspire! These animals are so cute! Love the card you made!